today i am thankful for the brief but beautiful life of a little pig named oscar. oscar was born this past july to a 600 pound mama that stepped on him the day he was born. her weight shattered his right scapula rendering his right front leg immobile and causing other internal complications. surviving as a 1 pound newborn piglet is hard enough on the farm with four legs. with three legs i knew the odds stacked against oscar and so i brought him into our home. i raised him on goats milk, banana yogurt, blueberries and cereal. he quickly became my everywhere companion. nick and i brought him to the mountains with the jordans. we brought him to cape cod with nick's family, canada and the vineyard with my family. he quickly became the best traveled pig on the farm. his preferred seat was on mine or nick's lap suckling on our hands or knees. he loved car rides and every time we got out to stretch our legs and let oscar pee or give him a snack we would have a little crowd around us cooing over our piglet. after a month of holiday from the farm oscar came back with nick, rudy, and i weighing just under 40 pounds. as hard as it was to let him go live like a pig, i moved him in with my other piglet, van gogh, and the two lived happily together amongst the adolescent turkeys in elizabeth's barn. they became inseparable. 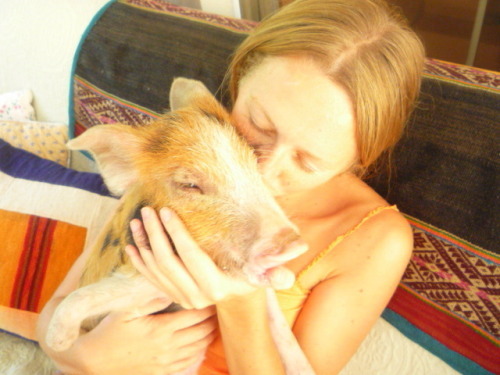 pigs are remarkable creatures and develop relationships with each other not unlike the way humans do. oscar would always tease van gogh by playfully biting at his missing ear and van gogh, similarly would tease oscar about his broken leg. oscar's injury was a constant worry for me and for all those who loved him. dad and his friend sketched out plans for a prosthetic of sorts. mom told me of a pony at the world equestrian games that had only three legs. michelle tried to contact veterinary students that would operate for free. nick was always studying & marveling at the way his good front leg was developing and compensating. i worried a lot. i was oscar's mama. i had been so from the first day when i picked him out of the fields all bloody and broken and brought him back to the bus. i would dissolve into tears when i heard stories of mamas... human mamas with human babies...speak to their fears of letting down their babies. it was my biggest fear. i was so scared that oscar was in pain. or was going to be in pain. i couldn't fix his leg but i wanted nothing more in this world than to fix it. i wanted him to have four working legs so that he could run around as fast as his brother. i wanted him to be able to stand at the water trough and not have to fling his upper body up on it just to get a sip. i wanted him to be just like all of the other pigs. but i guess that's just what made oscar so very very amazing. he wasn't like all of the other pigs. and if it weren't for his injury i would have never known him. i would have never snuggled with him while watching movies. my parents would have never had a pig live in their backyard. i would have never had so many friends and family finish letters and emails with "give my love to oscar". oscar died this monday morning. asleep in the straw in his hut alongside van gogh and the three big pigs he shared a home with. we don't know what precisely killed him. i knew that he was feeling unwell. i had spent this past weekend sitting with him in his pasture as he let me scratch his belly and tickle his ears. but he wouldn't eat. i should have done more about it. i should have involved elizabeth and taken him up to the house and spoiled him rotten. but i didn't. it is so shameful to admit, but i was tired. i was tired of worrying. i didn't love him any less. i was simply at a loss of what more i could do. i hope i didn't let him down. i hope he knew how much i loved him. So very sorry for your loss. That was one very loved little pig and I'm sure he knew it. You've written a beautiful tribute, Kate. Well upon refection of course it is obviously the former that enables the latter. and the lessons of utter pluck and determination you taught us. Oh wow! That is so sad and so touching about Oscar. Lost for words. Comments won't make you feel any better I know, but I really appreciate this story. And I know the feeling, not exactly of course, but I do a little. These wonderful creatures teach us so much and are brought into our lives for a reason, that's for sure. So sorry for your loss. you were the best mama to oscar. & these are such pretty words. Oh, Kate, you were a perfect person to take care of him. I'm so sorry he's gone, but you went so above and beyond and have nothing to feel bad about. He was really lucky to have you, and I'm glad you have so many memories of him. Thinking about you and Oscar. what a lovely tribute...I found this little bit from Winnie the Pooh for your marvelous, fabulous brave little piglet. "And I know it seems easy," said Piglet to himself, "but it isn't everyone who could do it." I'm so sorry for your loss of Oscar. He may have been here only a short time but, thanks to you, he had an extraordinary life. At the end of the day having a full life is what matters most and Oscar knew that because of you. this just breaks my heart. i love pigs and have so enjoyed reading about oscars adventures. he is so blessed to have been loved so deeply and by so many. and you are a true mother to have taken such tender care of him. he is now running free and watching over you. That just broke my heart. He was a happy piglet even though he had a short life. He was definitely loved and knew it. I am so sorry for your loss. I accidental stumbled upon your blog and I was following it because of Oscars story and the wonderful farm/piglet pictures. I always wished to own a pig pet. I just told my husband Oscars story and started crying-he definitely had a full life. I have just read this post now, and I'm so sad for you. I know how much you loved Oscar. I am sending you and Nick and everyone else on the farm (animals included) my good thoughts today. What an amazing Mama you are! I can't wait to see you in action with your human offspring...hint, hint! Sorry for the loss, love. I am one of the cubicle-bound, Internet-wandering souls who found this virtual farm world (your real world) a while back via Dear Baby, and I must say, I've since cried, laughed, and itched with the need to churn my own butter over your tender, simple, powerful words. I read longest acres like a book and now that I'm all caught up, something is different in the experience, perhaps a little less settled, but still - so lovely. And Oscar is still my all-time favorite post. Reminds me of Joan Didion. Anyway, thank you for taking the time to bring us all there with you, Nick, and your animal family on any given day. I know that I'm not only speaking for myself when I say, we are so thankful. Sitting at my desk at work reading this and sobbing. I know it was a while ago now, so I hope you now have all the good memories of Oscar and not as much pain. What a beautiful story. Sounds like you were the best mom he could have possibly had.